So I went on and on about my frustrations at work, the office politics, the entire work week which made me gasp for air and long for the weekend. After letting loose and rambling incessantly to my long suffering friends (I’m sorry you drove 6 hours for this Jas), all the work stress just felt so silly, light and trivial. Then I went home and chatted to Jan online. At one point we got on the webcam, she wanted to show me a dress that she wanted to buy for me. We couldn’t hear each other and she had to shout her questions to me, we ended up laughing hysterically and I wanted to call Jo over to my room so we could laugh together. Just one day into the long weekend, and I’m already recharged to face the challenges ahead. The wonders of family and friends. They make me feel soooo good. 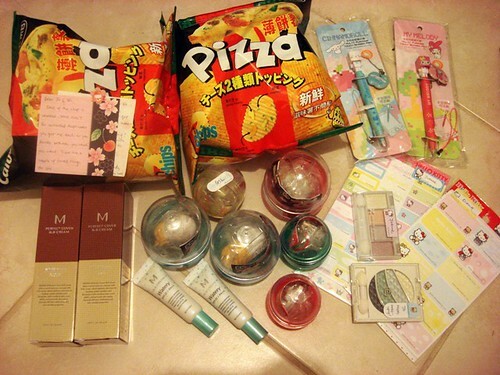 Includes my favourite Calbee pizza, pretty stickers, those plastic balls with fun toys that we love (some for Gill as well), makeup and cute stationery. Guess what was inside those balls? Mini plastic models of our favourite icecream on keychain, Jo loves the Korean watermelon icecream and mochi icecream are almost my favourite form of icecream (the Kowloon Dairy ones from Hongkong are soooo good). The cute cow light keychain is going to come in handy when we’re searching for our keys at night.I don’t think Jan and Andy are reading this, but thanks so much! We love the presents (^___^). 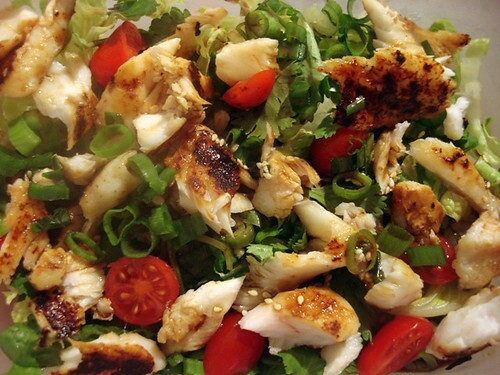 My miso fish salad a while back. I am discovering the wonders of frozen fish. I’ve always refrained from buying fresh fish only because they’re so expensive and I’m such a cheapskate. But I found out that frozen fish is actually very affordable (like $10 for 4-5 fillets) and actually taste very nice grilled and pan fried. Haven’t tried steaming frozen fish yet though, I hope it’s good. More fish! 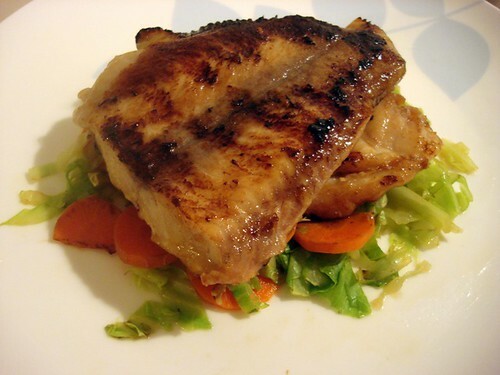 This time it’s grilled basa fillets on a bed of cabbage and carrots. I marinated with soy sauce, a little sugar and mirin. Another angle of the yummy fish. I’m going to enjoy discovering all the other types of fish, but I’m not sure Jo’s going to enjoy our fishy journey that much. Ok, a detour from fish. 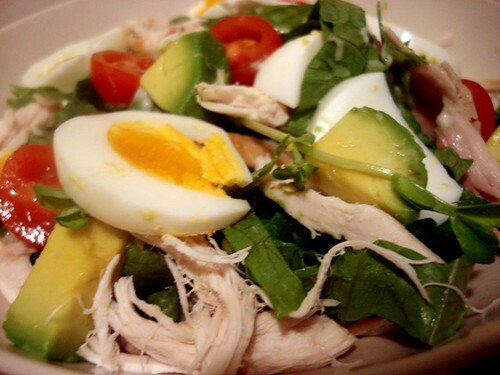 Chicken and avocado salad, how come chicken and avocado are so good together? One of life’s biggest mysteries. Jo is falling ill, even my colleagues are dropping like flies. It’s the flu season and with swine flu lurking around, please take care everyone. 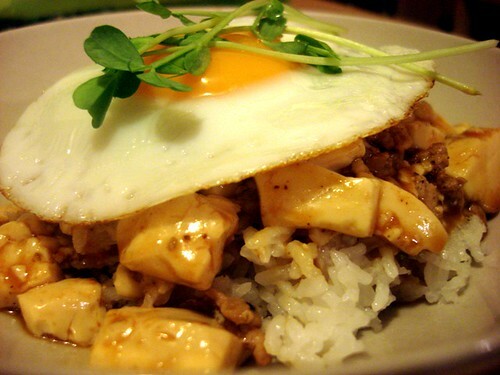 I thought I had better sustain Jo with hot food, so dinner tonight was mapo tofu, rice and a sunny side up. I’m heading to the heart of Australia for work soon, can you guess where it is? And Jaso from Gero is coming back for this long weekend, yeah, happy days ahead! I didn’t know whether to title this post H’s birthday or ‘The Night Gillian Ate A Lot’. H had mentioned Nicholsons Bar and Grill quite a few times, saying that the portion was huge and it was great pub food. 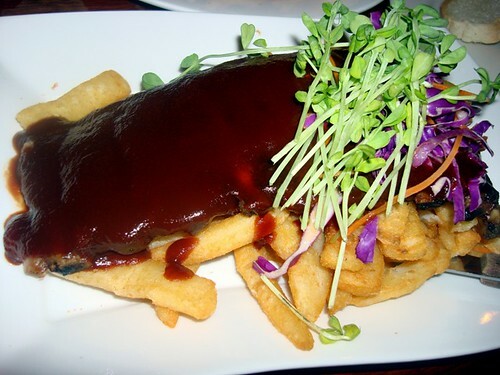 After some research, I realised that it’s pretty well known in Perth, quoting a colleague ‘I’ve never had anything bad there, the portion is HUGE and I couldn’t finish my steak!’. Good enough for me, convinced, I booked it for H’s birthday. No surprises, no balloons this time, just me, Jo and Gill. 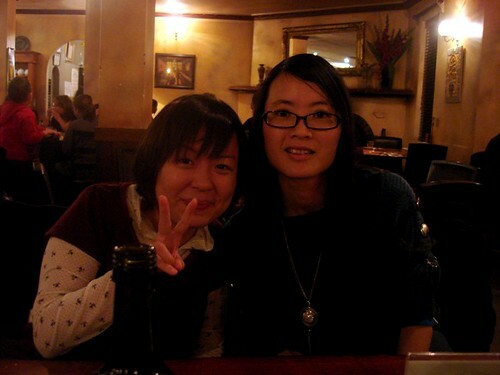 It was a very cold night (winter suddenly arrived in Perth and it’s freezing!) so we were glad to huddle in the cosy pub interior complete with a fireplace. Nicholsons menu is gorgeous and filled with meaty, hearty good pub food. I was tempted to try everything and want to return to try their Beef and Beer Pie and everything else on the menu. But we decided to order four dishes to share. 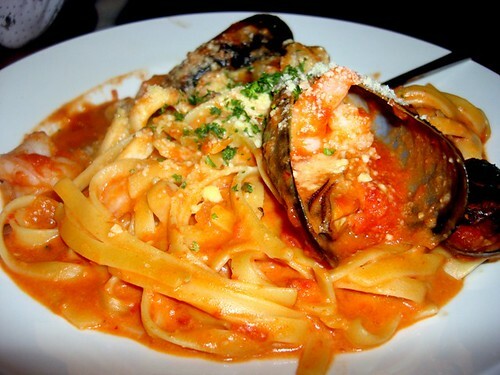 First up was Jo’s order of Seafood Marinara ($21.00) which came with fettucine and a lovely tomato cream sauce. While it wasn’t Ciao Italia’s chockful of seafood, it was still really tasty with a nice mix of calamari, mussels and prawns. Big portion by the way. Gill was torn between steak or seafood. Since I was going to order the seafood platter, she decided on steak. And what a steak it was! 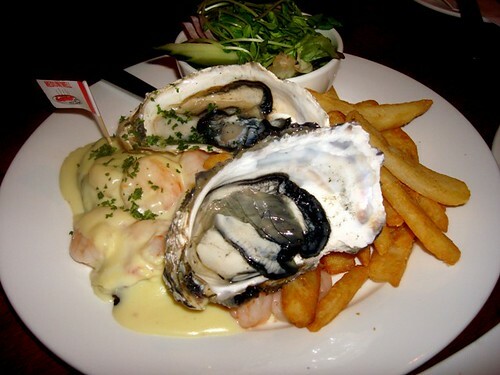 The menu description for Livingston Steak ($37.00) was grilled scotch fillet covered with prawns and garnished with oysters smothered in a rich creamy garlic sauce, covered with prawns and garnished with oysters, this I wanted to see. The oysters were sooo big, Gill said there were bits of grit in it so she didn’t like her oyster. But everything else was good but oh so sinful. Bursty prawns, tender beef and dripping in creamy creamy garlicky white sauce. Why are yummy things so bad for you? 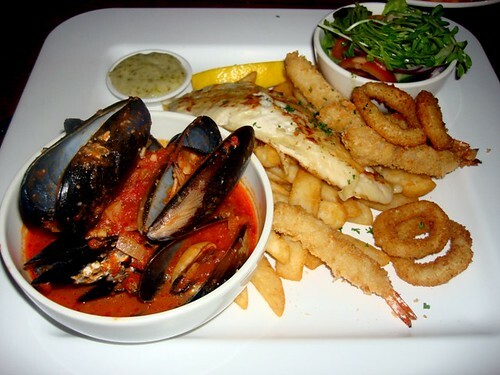 My Nick’s Seafood Plate ($36.00) which came with a bowl of chilli mussels, grilled fish, fried crumbed prawns, calamari , beef battered fries and salad. We ordered some bread ($3) to dip with the chilli mussels sauce, the sauce was quite good and I know Gill really enjoyed the big mussels coz she polished them off! Having cooked quite a bit of fish recently, I wasn’t so impressed with the fish and thought it was just average. In truth, the Left Bank’s seafood platter is now my epitome of a good seafood platter (will blog about it next time) so I think this was just good but average. H’s Hickory Smoked Ribs ($26.00) which was my favourite dish for the night, the ribs were fall-off-the-bone tender and slathered in rich bbq sauce. Usually bbq ribs are messy to eat but this one was fork easy. Very yums. I’ve read reviews that complain about Nicholson’s service, but truly, the service was impeccable that night. 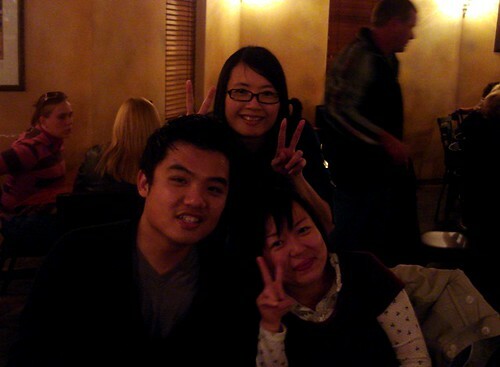 The waitresses were polite, friendly and accomodating. They offered to bring out our birthday cake and blare the birthday song on their radio system and even lit our candles for us. H was quite embarrassed because the bday song went on for sooo long and everyone in the restaurant was clapping along and even whistling at the end. 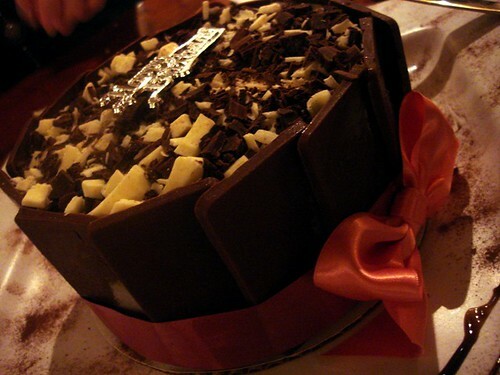 They even took our icecream cake out of the box and placed it on a nice square tray and dusted it with cocoa powder! Good service right? 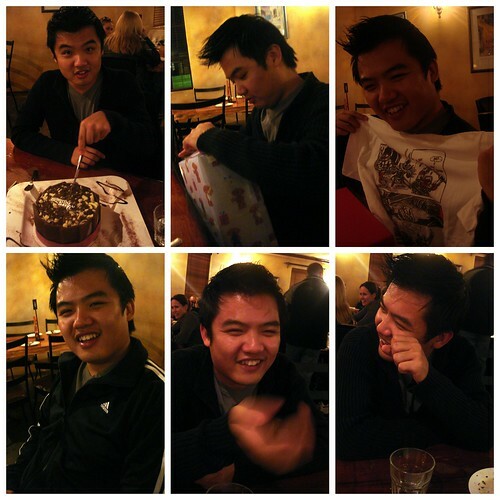 I think H was quite happy, he sure was in all smiles (actually he’s always smiling) while unwrapping his presents. 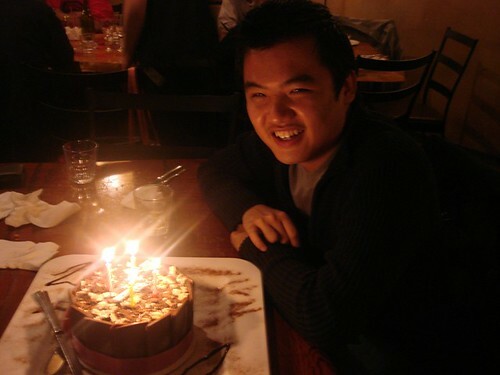 But I think he was happiest while eating his icecream cake which we specially ordered from Baskins and Robbins. H is the ultimate sweet tooth and loves all icecream. I found the cake tooth achingly sweet and couldn’t take much but of course no complaints from H.
We had a lovely night and a fantastic time celebrating the nicest guy we know (I’m sure Gill and Jo will agree), so happy birthday H, next year you get a birthday hat and balloon Y(^___^)Y! After a terrible day at work, I was so glad that there was a whole evening of cooking in the kitchen to keep my mind off the horrendous day. Yesterday Jo and I received a giant parcel from her bf in KL. 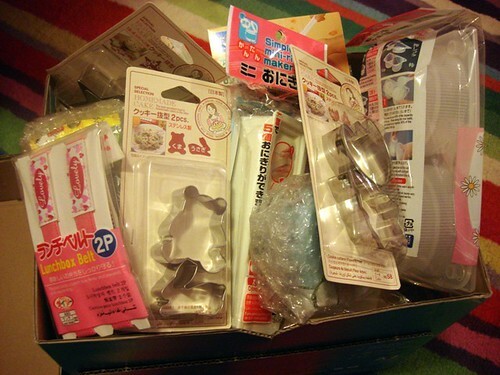 It was a box filled with the cutest bento gadgets including egg molds, cookie cutters, chopsticks and sushi molds. See, so cute! 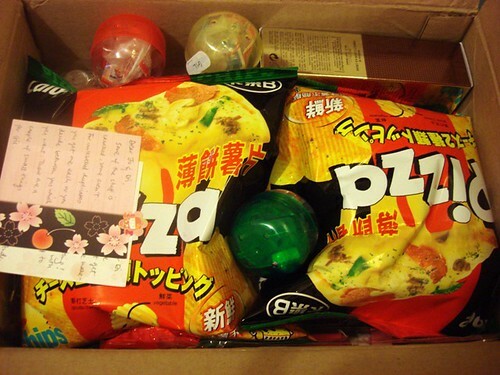 He also sent us our favourite snacks from Malaysia, Bika and Bin Bin. 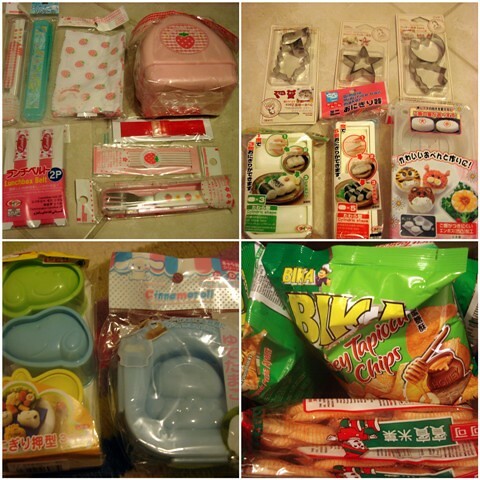 Once I saw the bento gadgets my little eyes lit up in glee, just in time for my birthday bento for H! Around the same time last year, I met up with H for lunch thinking that it was the last time I would get to celebrate his birthday for him. 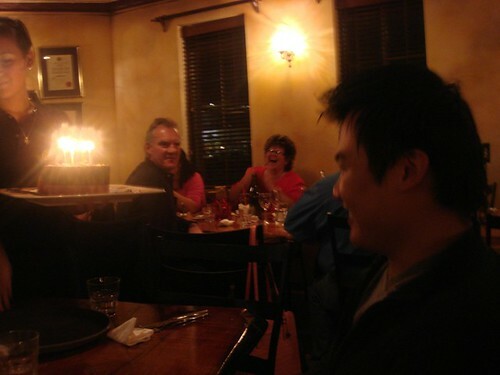 I’m so glad that all is better this year and I’m still able to celebrate his birthday for him. Officially his birthday falls on Saturday (we will be going out for dinner) but I wanted to make him a special birthday lunch bento for work. Since he couldn’t make it on Friday, we’re goin to meet up tomorrow instead. It’s Jo’s first day at relief teaching tomorrow, so I thought it would be nice to make her a pretty bento as well. Do you like her double decker bento box? It’s one of my favourites. I molded the sushi rice with one of the rice molds and wrapped it with nori. 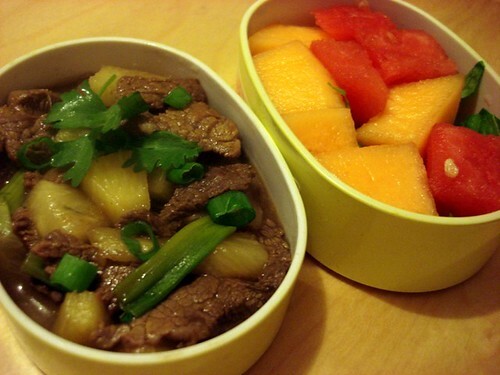 Top deck is stir fried pineaple beef, one of my favourite ways of cooking beef. 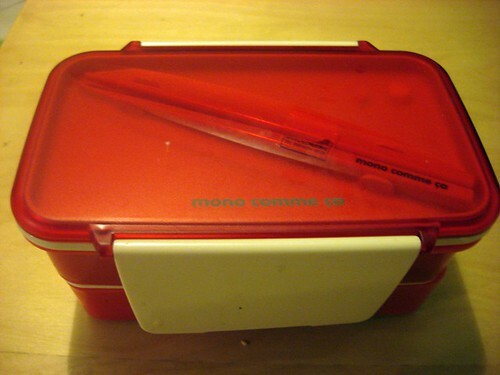 H’s bento box. 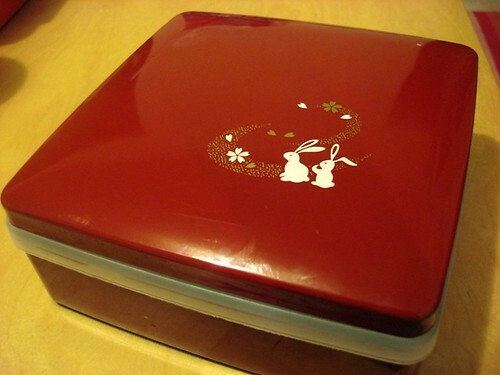 I love this traditional looking red wooden box with the two cute rabbits in front. 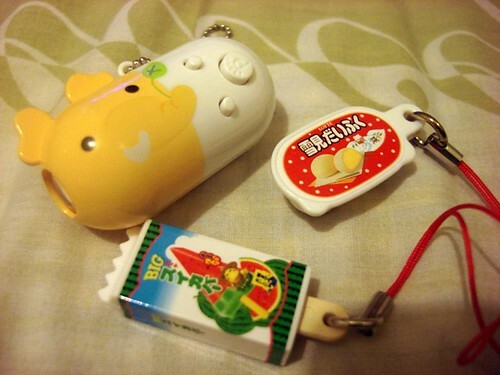 My mum bought this for me from Japan (^___^). Sigh, I miss my ah ma. 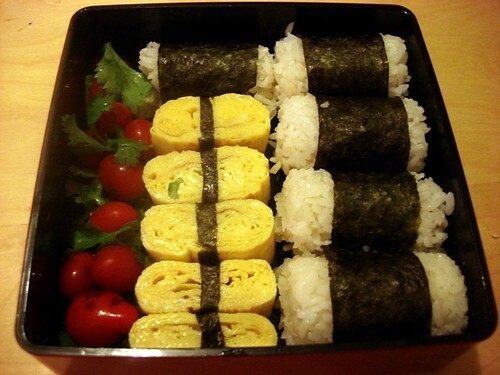 I love the new sushi rice molds, they look so neat and cute. I’m glad my tamagoyaki turned out good this time, I hope H likes it. I filled the extra space with grape tomatoes and coriander leaves. 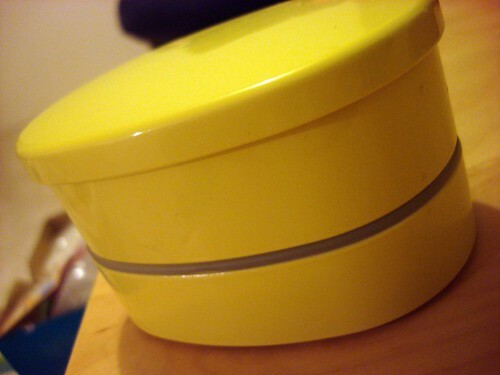 This little yellow bento box is also part of H’s bento. 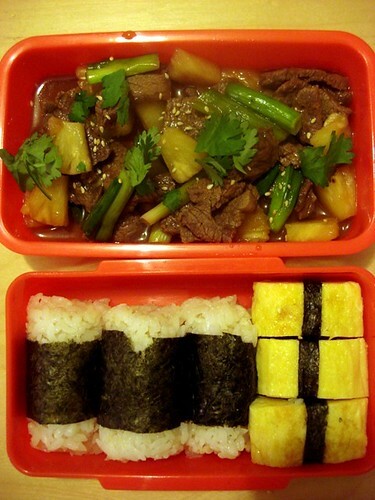 Top deck is also pineapple beef, it’s actually H’s favourite dish as well, I learned how to cook this from his god mother in Hongkong. Lower deck is fruit for dessert, watermelon and rockmelon pieces. Jo’s dinner tonight. 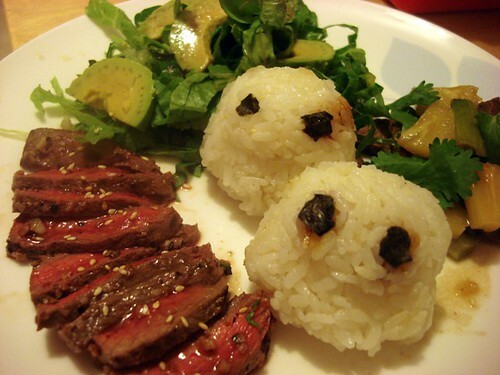 I used Cinammoroll egg mold for the rice but the shape didn’t come out right, it looks more like a ghost with big eyes (I made the eyes with seaweed pieces, haha). 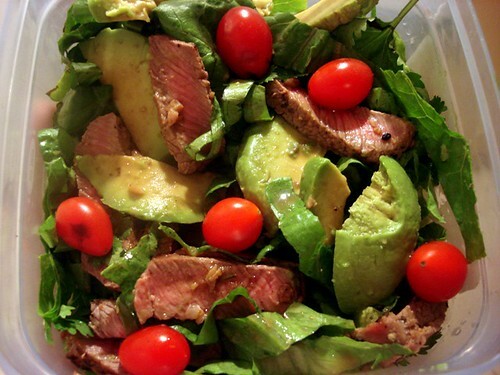 Avocado and lettuce salad and my grilled beef slices which I marinated with garlic, pepper and shichimi Japanese chilli powder. 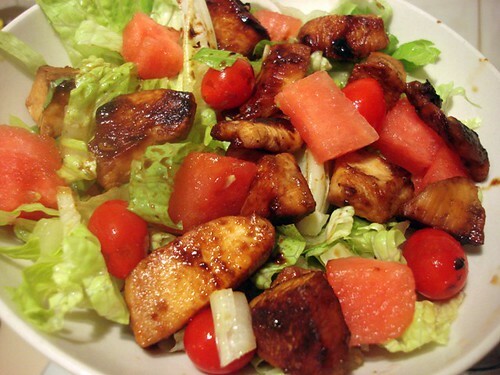 My lunch bento yesterday was grilled honey soy chicken pieces, watermelon and tomato salad. Pretty tasty even eaten cold the next day. I do miss hot food for lunch though. My lunch bento tomorrow, chilli beef and avocado salad. I will be meeting H tomorrow for his pre birthday bento lunch, I hope he likes it *fingers crossed*! Ta-dah, the first foodie pics on this blog! 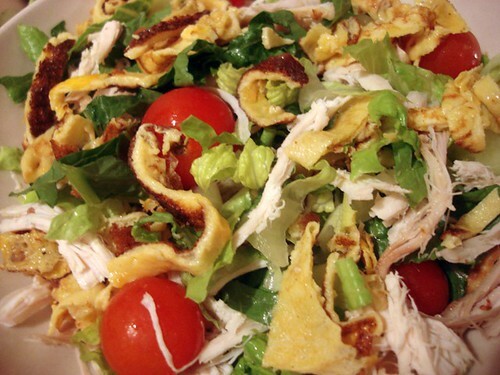 My lunch bento last week of chicken and egg salad with lettuce, cherry tomatoes, chicken shreds and Japanese sweet egg roll strips. 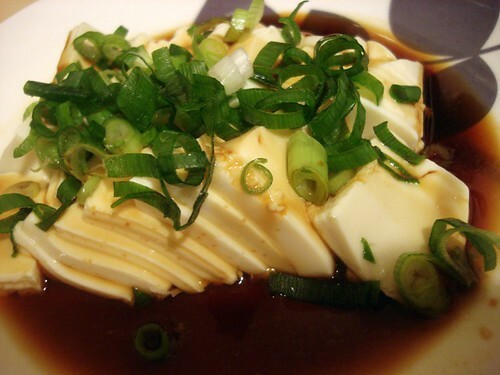 My new favourite method of eating silken tofu, I like them sliced thinly,cold and silky with spring onion and ginger dressing. A bit like eating cold taofufa with vinegary, sweet and sour flavours. Jo is more of a carnivore then veggie eater, I had a tough time last year convincing her to accept herbs like basil, rosemary, parsley and coriander (her most hated herb). But now she likes them! She also hates eating fish, when we were young we used to tell your grandmother ‘ mahmah, wo beh hiao chiak hu’ (grandmother,I don’t know how to eat fish in Hokkien) whenever she tried to scoop fish onto our plates. 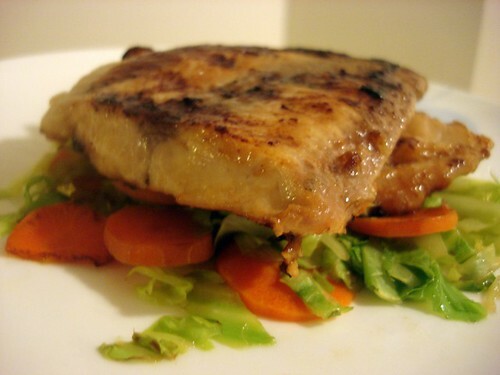 Today’s dinner was grilled red emperor fish fillets (seasoned with rosemary, pepper and salt ) on a bed of lettuce leaves and grape tomatoes. 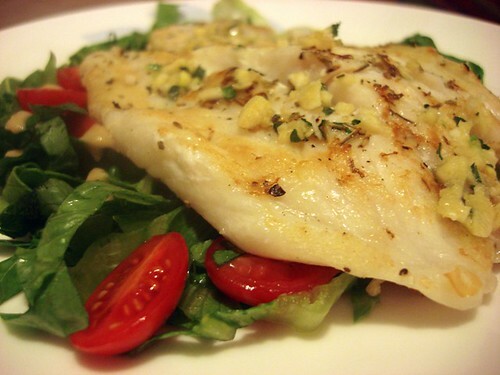 I melted a little garlic butter on Jo’s fish fillet to mask any ‘fishy’ smells, she said the fish was tasty! Yeah Y(^__^)Y I’m predicting more fish for dinner soon. Or maybe I should say whale and dolphin. Me being the whale and Jo being the cute dolphin. Lately Jo and I have been swimming after I come home from work during the weekdays.I wonder how long this bout of swimming will last? I hope all through out winter and perhaps forever. When Jo and I were young, we were part of a swimming team and had to train in the pool every weekday under the watchful eyes (and timers) of our coaches. How many laps did we swim each day? I can’t remember, can’t be less than a 100? You would think that with that much swimming, we would want to rest during the weekends. But no, for a treat, we would go swimming during the weekends as well! But it was a different sort of swimming where there were no repetitive laps, just the deep blue water world and our imaginations. The stories that Jo and I would get up to, mermaids, princesses, fishes, houseboats. After swimming,we would meet up with the rest of the family and have dinner by the poolside restaurant. I remember our favourite was the beef burger which came with a sunny side up. What a treat! It’s funny that after so many years, I am again swimming with my sister. Although there are no longer mermaid stories, giant burgers or staring at the cake display afterwards (come to think of it, we never ever bought a slice of cake), swimming with Jo is still really really nice. If only Jan and Darren could join us, if only I could meet my family for dinner afterwards, if only, if only. Welcome to my new blog! Hopefully this blog will chronicle my new foodie adventures in Perth, in the kitchen and with my family and friends!